At last it's available. Eclectic Breaks' Pro X Fade crossfader is now available to order in The Skratchshop - the first retailer in the UK if no the world. You'll have seen the articles on SpinScience, the exclusive first review with this site and the movies of 2Tall, Netik and Tigerstyle scratching up a storm at PLASA. Now you can get your hands on your very own fader. 18 months ago, we first cast our eye over an early version of MixVibes at MusikMesse 2004. It's fair to say that we weren't overly impressed with the product at that time. But how things have changed. Now being distributed in the UK by Vestax and having such scratch Gods as Netik, Troubl and Birdy Nam Nam willing to put their name to it, MixVibes has developed into a fully rounded product. Deft ends his marathon run of reviewing digital scratchy stuff with an indepth look at MixVibes. Deft has been a busy fella recently. Having ummmed and ahhh'd over Digiscratch and then drooled over Serato Scratch, he's also managed to find time to play with another digital solution - this time djDecks. Not as well known as the others nor having the flash and glitz of whole stands at the big exhibitions, djDecks looks every part a competitor for the big boys, but with a bargain bin price tag. So that was PLASA 2005. Substantially better than 2004's somewhat damp squib of an exhibition (although there was an element of dampness about the run-up to the opening), 2005 most definitely showed a big leap towards the often fought against digital age. Not literally you understand, although a trout stream with exclusive fishing rights would be a cool prize... but I digress. The winners are in for the DMC/Technics World Finals are in. the lucky people are Incise and Chad Rowe. I'm sure DMC will have been in touch by now. But there is still a chance to see the finals from the comfort of your own home, cave, tent or wherever you actually live at a discounted rate thanks to scene legend Sir Lord Mr Doctor DJ Loop Skywalker. The Pro X Fade roadshow hits PLASA in fine style. Not only did the Eclectic Breaks stand house some serious DJ talent over the 4 days of PLASA but Selmark in the upper level also had the Pro X Fade on display as well. As did every wall, lamp post and almost every other flat surface in the vicinity of Earls Court. If you had the ready cash, you could have walked away with a Pro X Fade for 80 quid. First seen by us at MusikMesse and now here at PLASA, Mackie's surprise venture into the skratch scene in the shape of the d2 takes a step nearer release. The last time we posted any info, the Mackie guys were very active on that post and have made some revisions to the design based on all of our comments. Some of you can be forgiven for thinking that there wasn't a Rane stand at PLASA. Had you cast your eyes to the heavens, you would have seen a banner telling you exactly where it was - on the Sennheiser stand - their UK distributors. Nothing new to show except a rotary version of the Empath. There's been much talk recently about crossfaders. The Pro X Fade has been getting it's lion's share of our attention and quite rightly so as it's the mutt's nuts. But please spare a thought for other companies out there trying to make a positive change with the most important part of any scratch mixer. I spent a little bit of time with Infinium and they filled me in about their new optical fader that's being used in the forthcoming Rodec Scratchbox and Mackie d2. Aside from the Rodec Scratchbox being plonked right in the middle of their stand, Gemini showed their hybrid CDT-05 - plugged in and everything, although not linked to a mixer. Booo. But the recently covered iKey made an appearance and rather nice it is as well. it's been a bit quiet on the scratch front in recent times for Pioneer. After dazzling the world with God's own scratch mixer the DJM-909, and the initial price based flop that was the 707, they've plodded on and pretty much own the scratch mixer market thanks to a ridiculous price drop to 300 of your local currency on the 707. They did however show a cool flat panel speaker that was knocking some serious ear bleeding volumes out on the stand. Denon always put on a good show at PLASA - waaaaay better than their European counterparts. I don't know why this is but there's always a good selection of gear to play with on the stand. This year was no exception and of particular interest was the newly released DN-S3500. Day 1, being the public day was expected to be a more sociable event, where you hook up with old friends, hang out and drink beer. Day 2 however was back to business, but somehow I still managed to hang out and drink beer as well. Now I'm sat on the 18.50 out of Kings Cross northbound back home with 9% battery power left on my powerbook and absolutely no energy to write reams of verbiage about all the cool hip stuff I've seen today. Tomorrow I should be back on track to give you a little more info about Vestax, Mackie, Infinium faders, Ecler, Gemini, Rodec, Stanton plus other stuff I'll no doubt remember as I wade through the photos. But what I do have is some frankly awesome footage (35 minutes worth) of 2Tall, Netik and Tigerstyles giving the Pro X Fade some serious hammer. It was worth 2 days in London with stupid prices just to capture this. After last year's damp squib that was PLASA 2005, I had high hopes for this year and I wasn't disappointed. I think everything we've seen today has been covered at some point in but nothing quite beats seeing for real. But I'm pretty wacked so I'm just going to give you a glimpse. I'm sat on a crowed train PLASA bound and figure I'd use this time to give you an insight into what the posse are giving up 2 days or our precious personal time to see. So it's the witching hour and it's time for the world exclusive. And I think it's quite a biggie. In recent times calls have been made for manufacturers to put hard disks inside their CD decks and Numark have been listening. 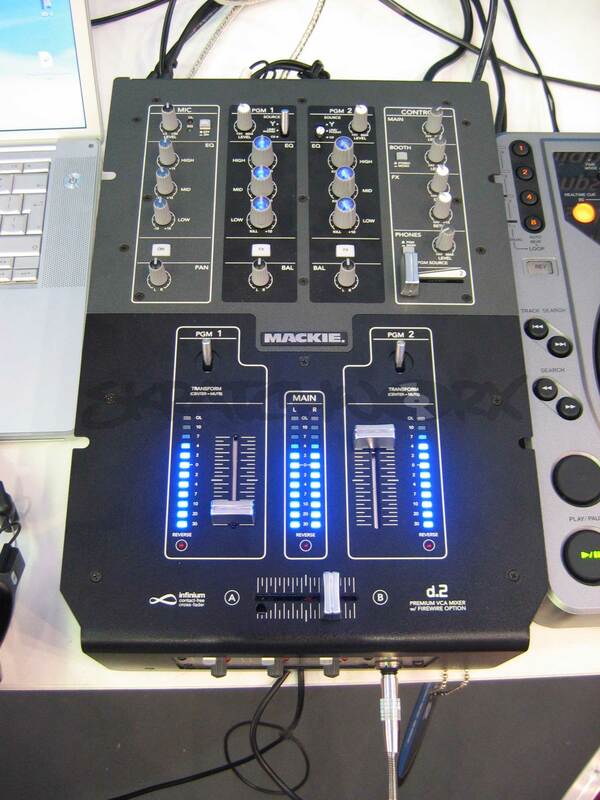 Ladies and gentlemen - I bring you the Numark HDX. At midnight tonight GMT, I'll be busting some big news - big enough for me to stay up to bring it to you people. I'm sure many of you would sell a family member to be at the DMC Technics World Finals each year but for some it's not really possible. However, this year DMC are making it possible for 2 lucky people to experience the finals via the beauty of the internet. Up for grabs are 2 weekend video streams so you'll be able to be there in spirit, if not not in person. Something like a full year ago - at PLASA 2004 - we first got to play with a prototype fader from Eclectic Breaks. I also spent a great deal of time with the EB head honcho Siya who explained his vision for the fader, EB and the scene in general. Now 12 months later, his vision has become a reality - the Pro X Fade crossfader is ready. I've had one for a little while now and it's time to hear what I think about it. Only a week and a half later than I'd planned, www.skratchshop.com is finally open in it's own little way. So now you get your hands on the new Noisy Stylus LP called "Table Manners" - available in CD and double vinyl. IMPORTANT NOTE: For the next week or so, I'm only doing UK deliveries until I can sort out postage to Europe and eventually the rest of the world. Thanks you for your patience. 6 of you lucky people have won free entry tickets into the DJ technology fest that is PLASA. You've been informed and 4 of you have responded. Check your mails people. But for those who missed out, the very nice man at Denon UK has stepped in at the last minute with the offer of 10 tickets.